Family and cultural heritage usually play a huge role in weddings, no matter where you’re from, or where you hold your wedding. This certainly rang true for Adelle and Joel who reside overseas, and held a formal dinner in Malaysia, hosted by Adelle’s family. 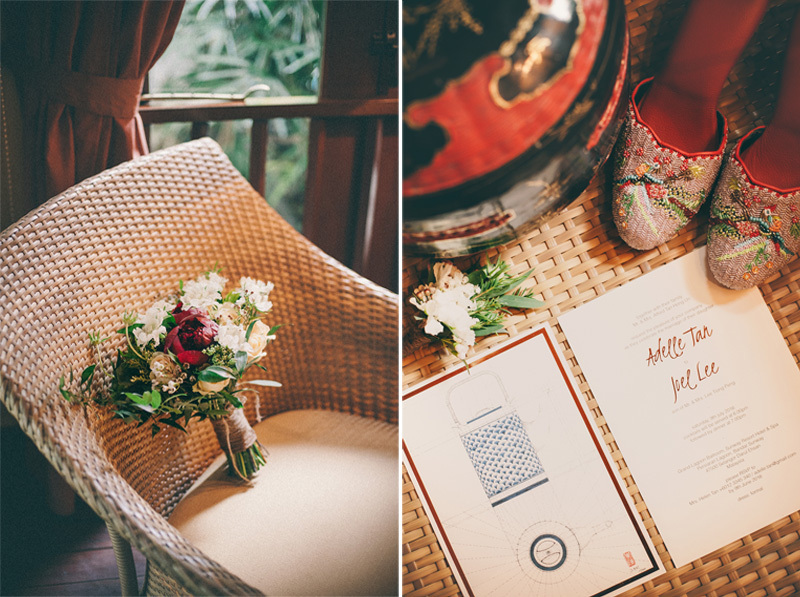 We are pleased to share some lovely pictures from Adelle and Joel’s Malaysian reception, thanks to MunKeat Photography! Left: Adelle’s bouquet with a single rustic red peony. Right: Adelle’s grandmother’s “Bakul Siah” was used to store red packets from loved ones. Custom-made “Kasut Manek”, gifted from Joel’s mum to her new daughter-in-law. The wedding invitation, featuring a hand-drawn architectural illustration of Joel’s late grandmother’s teapot. 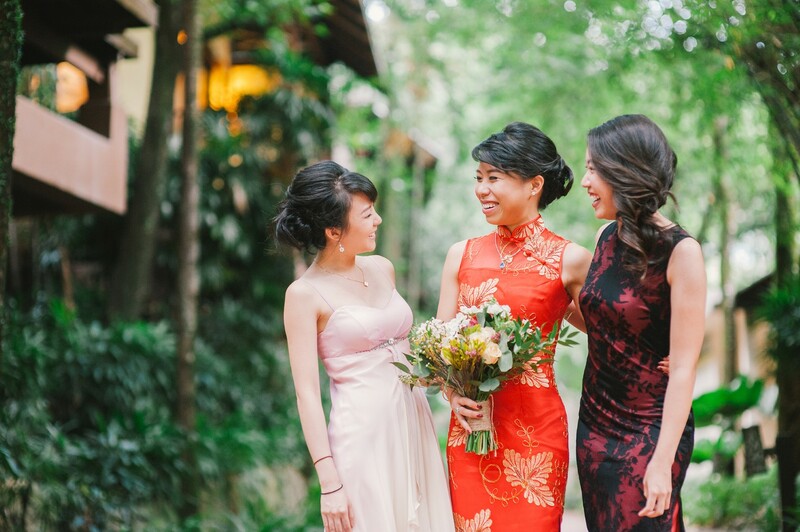 We always love a modern wedding that is infused with tradition and cultural heritage, which is pretty close to Adelle’s description of their wedding: “Thematically, modern classical fused with Chinese traditional motifs.” In their wedding invitation (seen above), Joel’s late grandmother’s teapot was depicted. 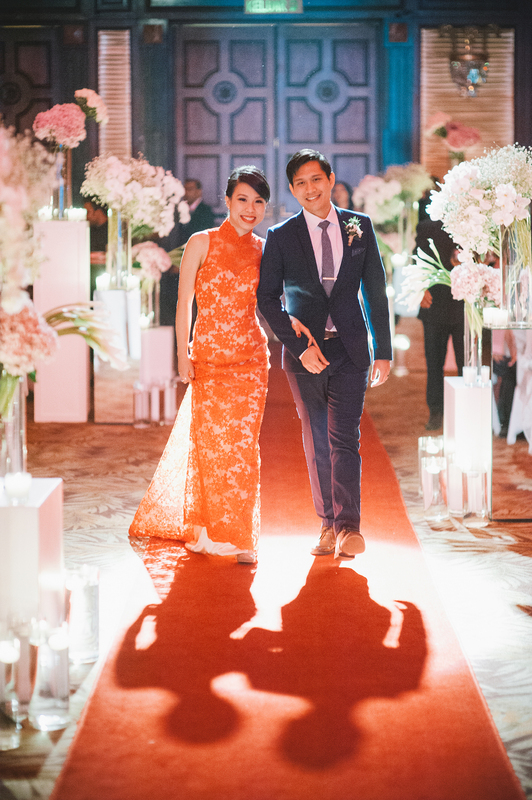 The architectural illustration was hand-drawn by Joel, and painted by Adelle, symbolizing a celebration of and the love for the couple’s Chinese and Peranakan cultural heritage, as well as of how they met in architecture school 10 years ago. 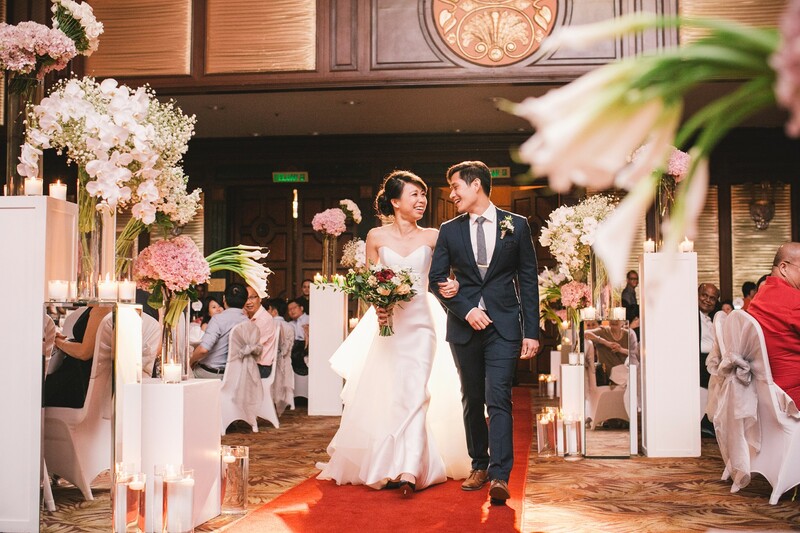 Working closely with their wedding planner Lane Ho of MY Wedding Planner, our couple relied on recommendations for most of their vendors – including us – and soon found out that we had previously worked with a majority of Adelle and Joel’s local friends on various events. Beautiful Adelle shares a moment with her best friend Joyce, and her “twin cousin”. As our bride’s family picked the venue for their dinner reception in Malaysia, Adelle and Joel, together with Lane, their wedding planner, worked closely with us to come up with the decor that would suit the interior design of the venue as much as it would suit their taste. Keeping the venue decor in mind, Adelle and Joel sent over a mood board of what they liked, what they thought would suit the venue, and left it to us to put everything together. 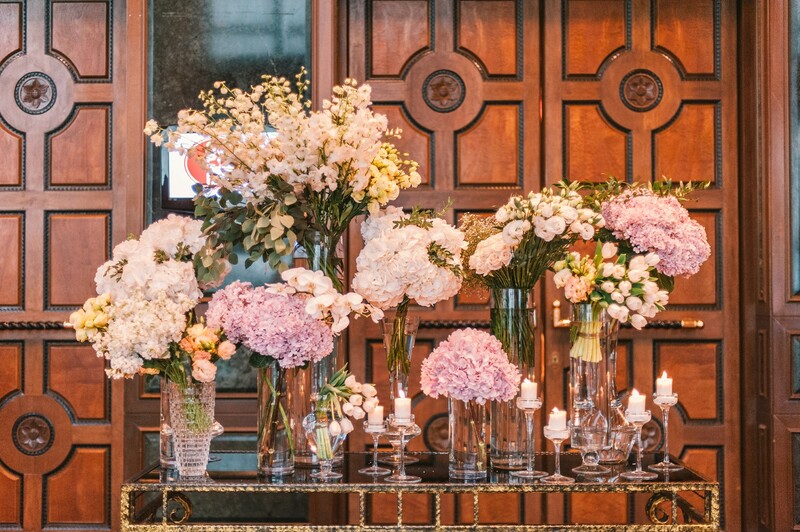 Tiered floral arrangement at the entrance of the ballroom. Using different flowers and vases to create varying textures and heights. Floral arrangements along the ballroom aisle, with an image from Adelle and Joel’s wedding in Melbourne as the backdrop. 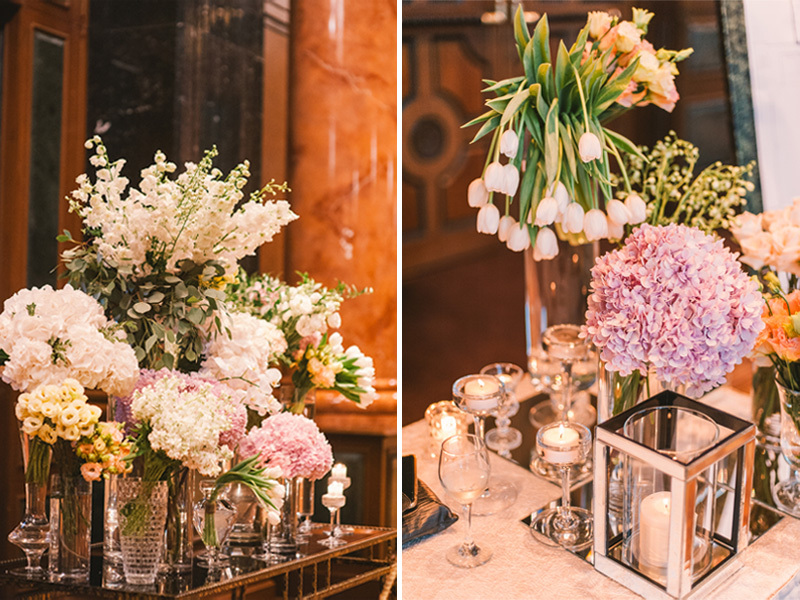 While we use tiered arrangements with many different types of blooms and textures to soften the interior decor of the ballroom, we also keep the lines clean and colours muted with simple box pedestals, and all-glass vases and candle holders. Joel and Adelle’s second walk-in. We are so happy, Adelle and Joel, that you chose us to be a part of your special day, and also for sharing it with our readers here on the Blog. Thank you! All of us at Wishing Tree wish you the very best on your wonderful new journey together. “Wishing Tree came highly recommended by our wedding planner as well as a good number of local friends who we were highly reliant on as we reside overseas. We sent a mood board or what we liked and thought would suit, and left it to Wishing Tree to showcase their creative flare in putting it together. 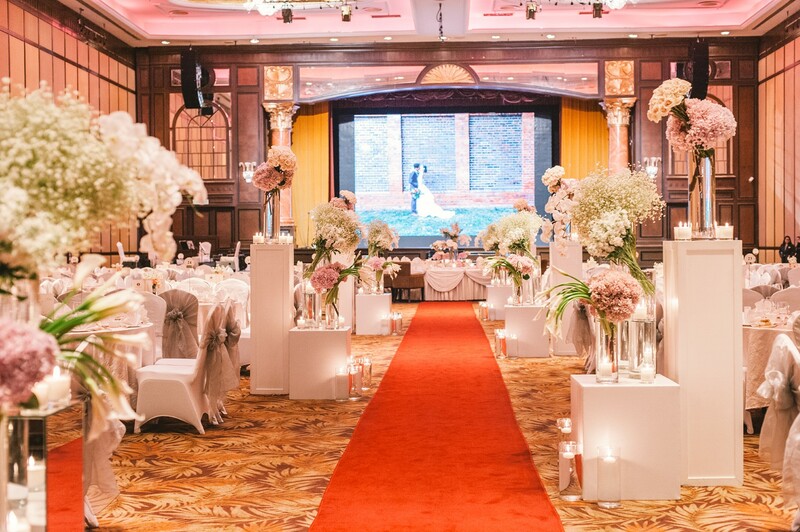 They did a fantastic job interpreting our wishes for the overall decor and marrying it nicely compositionally with the interior of Sunway Resort Ballroom. This was no easy task considering the expansive brown and gold motifs of the venue. The decor and floral arrangements were very well received and made for a beautiful and memorable night for our family and friends, which was the most important thing for us. Wishing Tree was also meticulous with the little details, right down to the experience of every significant individual at our wedding reception. I loved the single red accent of deep red peony against the neutrals of my bridal bouquet, as well as the matching boutonnieres for the bridal party.